The Casa Velas is one of the jewels of the Velas Resort’s chain of hotels. This 80-room, adults-only boutique hotel provides a quiet and relaxing environment that is unmatched when coupled with the outstanding service and superb food. 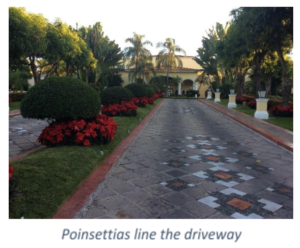 Approaching the hotel, one’s first impression was that of entering a wealthy person’s hacienda, with the large wrought-iron gates and guard house, yellow-painted walls with white base and caps. All visitors and guests are screened upon entering the facility, which gives one that extra level of comfort, not that there are concerns for people’s safety in this area of Mexico. Situated on the Vallarta Marina Golf Course, the grounds are wonderfully manicured and maintained in top condition. Originally constructed along with the golf course circa 1990, the resort started life as the Quinta Real and was purchased by Velas Resorts in 2005 and there was a major renovation in 2015. Velas Resorts started life about 25 years ago when they were developing the Marina Vallarta area. Owner Lic Eduardo Vela purchased a 10-acre beachfront location with views of the Sierra Madre Mountains in the distance and started building the Velas Vallarta that was originally planned to be a condominium project. Shortly after construction was finished, Lic had returned from Spain and considered the idea of turning the property into a resort. After about 25% of the 345 rooms were sold, the move was made to change it to a hotel. Casa Velas, as indicated, is about relaxation and good food in a child-free environment. If you are looking for boisterous activities and music, this is not the place for you, but that is the reason most people love this idyllic spot. Although the property is not on the ocean, there is a Beach Club a few minutes away that is part of the Casa Velas whereby you can enjoy the beach. This location also has a great restaurant that serves lunch and dinner. The casual daytime atmosphere transforms to a romantic dinner environment where one can enjoy gourmet food while watching some of the amazing sunsets over Bandaras Bay. Some of the best Angus steaks can be enjoyed here along with many ‘special’ offerings from time to time. There is also an infinity pool, beach lounge chairs and canopies to shield you from the sun’s rays if needed. A constant shuttle service transports you back and forth to the hotel. 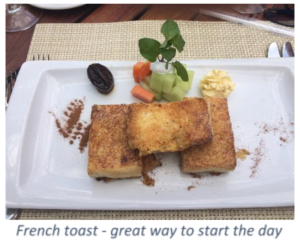 Back to the main hotel, when it is time to eat, there is the excellent restaurant (Emiliano) that serves breakfast, lunch and dinner. It has both inside and outside dining and due to the superb climate in this area of the World, most people choose to eat outside. In the morning or at lunch, you will likely be met by Bernardino, who is one of the long-term servers here. Cesar, the food and beverage manager, will see to it that your culinary needs are met and should none of the excellent menu selections appeal to you, let him know and the experienced chef will prepare what you want, limited only to ingredients on hand. 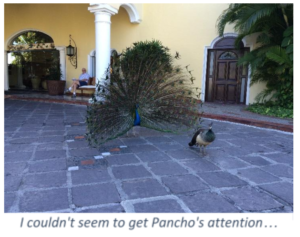 Pancho, the resident peacock, can be seen strolling around the grounds and pays a visit to guests in hope of a morsel of food. Several ponds around the grounds are stocked with colourful koy fish and the one at the main entrance has turtles also. For a fun experience, ask the concierge for some food to feed the turtles and koy. 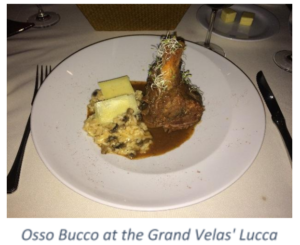 With one restaurant, the food choices can be limited compared to what is available from larger resorts that boast several restaurants with variable ethnic offerings. 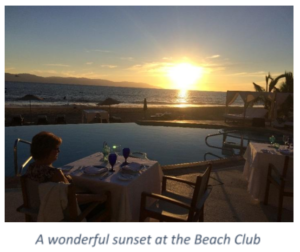 However, Casa Velas varies the selections adding special menus with guest chefs from the 5-Diamond Grand Velas resort located in Riviera Nayarit (about 20 minutes north in Nuevo Vallarta). This high-end resort sports three gourmet restaurants plus another at the beach. The restaurants are Frida (Mexican), Lucca (Italian) and Piaf (French). 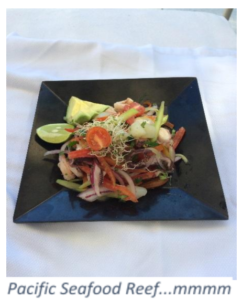 The beach restaurant is named Azul and is primarily buffet-style. Also, for each stay of 5 or more days in a week, guests are extended the option to have one meal at the Grand Velas…a treat not to be missed. Bear in mind though that the Grand Velas is a family resort and the only restaurant that restricts diners under 12 years old is Piaf. 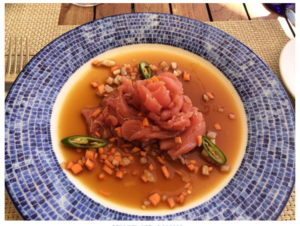 We enjoyed outstanding meals at Grand Velas’ Piaf and Lucca during our 2-week stay at Casa Velas. Although physical activities are not extensive at the resort, there is lots to do in the area and in Puerto Vallarta. The resort does have ‘activities’, but not necessarily the strenuous type. There is a fully equipped gym with the usual assortment of treadmills, stairclimbers, weights and combo machines should you need to burn off any accumulated calories. It is also a short walk to the marina where several shops, bars and restaurants are located, as well as adventure stores that can provide anything from deep-sea fishing to zip-lining. The town of Puerto Vallarta is steeped in history and is a must see if you have never been there. Another must see is the Rhythm of the Night performance. This entails a boat ride to the tip of Banderas Bay where you will be treated to an excellent meal and a great show…all outdoors. You can also check out Vallarta Adventures for everything from zip-lining to SCUBA diving. Resort-based activities include cooking classes around the pool, cigar-making demonstrations and yoga. Pre-dinner activities include wine and cheese, margaritas, tea time and Martini hour. After a delicious meal, have Benny in the Lobby Bar serve you with an aprés dinner drink of your favourite liqueur while listening to the live musical entertainment. After a ‘hard’ day around the pool it is time to retire to your well-equipped comfortable and attractive room. Of the 80 suites, there is one 2-bedroom Ambassador and one Presidential suite. All other suites are one of three types; Master suite (463 sq.ft. or 614 sq.ft. with Jacuzzi), Grand Class suite (614 sq.ft. or 830 sq.ft. with Jacuzzi) and Wellness suite (1,345 sq.ft. 2-level). Most suites have a balcony/terrace with plunge pool and garden or golf course views. Pillow selection and comfortable mattresses ensure a good night’s sleep and if you do imbibe a little too much, there is a 24-hour room service menu. Around the pool you will find comfortable lounge chairs and plenty of them…no need to reserve unless there is a particular spot you would prefer to be. Areas are divided into smoking and non-smoking and you can choose either shaded or unshaded sections. Much of the shade is provided by the towering palm trees and vegetation separating the pool area from the golf course. Servers are making their rounds frequently to ascertain guest’s needs. There is a swim-up bar under a large palapa where you can quench your thirst while staying immersed. One can either go to the restaurant for lunch or stay around the pool, ordering from the Aqua Bar menu; my favourite being Pacific Seafood Reef, a mixture of octopus, scallop and shrimp dressed in lemon-coriander oil. 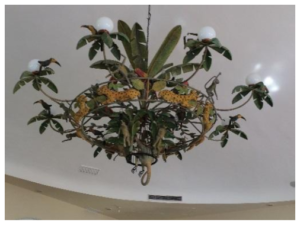 One interesting aspect of the hotel is the artistic presence of Guadalajara-born artist Sergio Bustamante evident throughout, from the amazing chandelier in the main dining room to the proliferation of masks that adorn the rooms. Sergio has a gallery in Puerto Vallarta that one can visit. The services at the resort were first class, from the well-equipped gym to the pampering spa. Internet was complementary and for the most part was good. It worked better around the pool than it did in the room, where some sporadic signal loss occurred. The Marina Vallarta golf course on which the hotel is situated is not part of the resort but golf packages are available if desired.